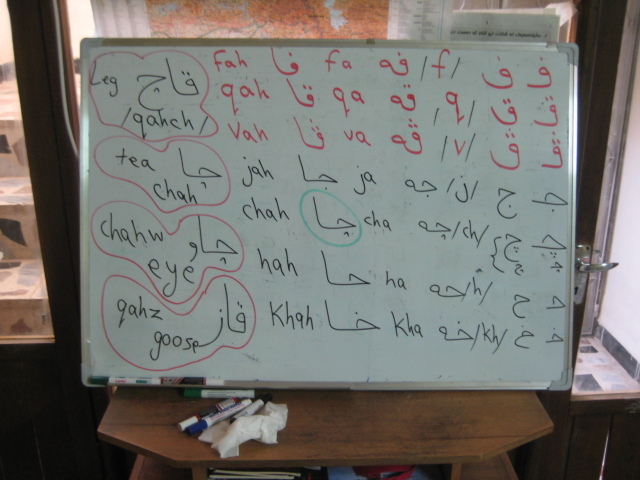 The last few days I’ve finally taken up my task to learn how to read write and speak Kurdish. Fortunately I have a great teacher, Mohamed who works in one of the local schools teaching English and such and he is blessed with enormous patience and understanding. Unfortunately for him, I have the working memory of a gnat and progress is slow. Kurdish is an old language, written in an Arabic style and is a mix of several regional dialects which have been formalized into a distinct language all it’s own. It is read right to left, has numerous dots in groupings of one, twos and threes, above and below the letters which indicate variations of pronunciation, vowels and so on. Then there are upside down v’s and right side up ones too, again variations of pronunciations or short hand for three dots, the upside down ones. One hopeful note about my education so far is that yesterday when I went out for a going away lunch for a departing team member, I was able to recognize some of what I am learning in the signs, billboards that I saw on the way to the restaurant. The photos below are of my teachers Mohamed and me during my lessons and the second is the days learning. Everything on the board begins on the left and works right. Letter at the beginning of the word, the second at the end of the word, short vowel, long vowel and a short list of words to practice using them. The road to becoming a fully functioning CPTer is a long one before one can go and begin working with our partners but, its worth it. CPT’s work is so different from being in the US Army. Here with CPT we immerse ourselves in the culture and learn from one another, with deep respect and share and support each other as we travel together. In the military, we brought and surrounded ourselves in a fortress of our own culture bringing McDonalds, Pizza Huts, movie theaters, bowling alleys, grocery stores and all the Americana we could muster to make it more like home. Yet in doing so we separated ourselves from those that existed on the far side of the wall and in our isolation demonized them out of ignorance and in our self righteous arrogance, looked upon them as less than human. Hopefully, someday, the work of CPT and others like it will lessen the need for the military and be able to lift each other up together as equals in the eyes of God, also known as Allah.